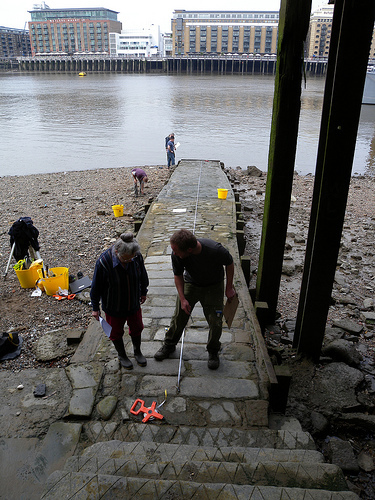 This site was recorded by the Thames Archaeological Survey and was known to have surviving archaeology relating to post-medieval use of the foreshore. Fieldwork undertaken at the site by the TDP / FROG included recording the Victorian masonry and timber causeway, with associated log drain, and the remains of a small vessel used as bargebed make-up. 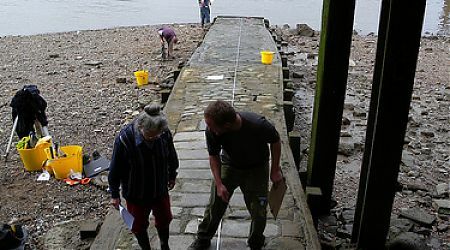 Other archaeological features of interest on the site include the substantial remains of a series of timber wharves and earlier jetties located below 20th century structures, crane bases and brick built riverside walls. An interesting range of artefacts have also been noted at the site including ships nails and disarticulated nautical timbers, glass bottles and clay pipes, and modern Hindu ritual artefacts. Check out the articles below to learn more about Alderman Stairs.